For a limited time, a bundle of PDF tabletop rulebooks built on the Fate system is available for $7.95. Bundle of Holding, a website that offers collections of tabletop RPG ebooks at discount prices, is reprising its Bundle of Fate, originally offered in September 2013. For the next four days, you can buy a bundle of tabletop RPGs built on the Fate rules at a great discount. For $7.95, you can get all six complete PDF rulebooks in the core collection, valued at $38. Or, if you pay more than the current threshold price - $15.77 at the time of this writing - you'll also get four bonus game books, for a total value of $85. 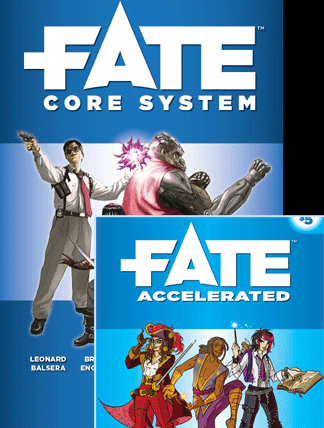 In addition to the free Fate Core and Fate Accelerated rulebooks, the core package includes Bulldogs!, a high-action space adventure, Ehdrigohr, a fantasy that draws from the myths and folklore of tribal and indigenous cultures around the world, Full Moon, a lunar sci-fi, and Spirit of the Century, the pulp RPG that popularized Fate. The four bonus games you get for paying more than the threshold price include Diaspora, a hard sci-fi with rules for starship battles, The Kerberos Club, a superhero steampunk set in Victorian London, Legends of Anglerre, a gritty fantasy, and Starblazer Adventures, based on the classic British sci-fi comic series from the 1970s-80s. Fate is a generic and customizable RPG game system with no fixed setting or genre.